Scouts, staff, and volunteers in First Aid, CPR/AED, and Wilderness First Aid (WFA). The agreement offers both student and instructor materials at a reduced fee to help increase participation in any of the emergency-care courses available. Current instructors are offered reciprocity with ECSI if they are currently teaching CPR, First Aid, or WFA with another provider and can demonstrate competency. For current providers who would like to become instructors, a process is available through ECSI. PLEASE FILL OUT OUR SHORT INTEREST SURVEY FORM HERE AND SIGN UP THROUGH ECSI AND OUR ECSI EDUCATION CENTER....SEE BELOW FOR DETAILS! 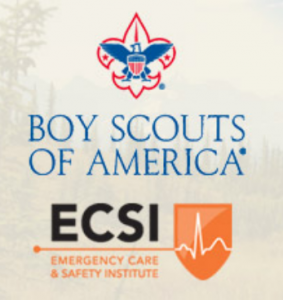 If you already have adequate content knowledge in the course(s) that you would like to teach (for example, first aid or CPR) and can also demonstrate adequate teaching experience (for example, you are an instructor from another nationally recognized training organization), you may request instructor reciprocity and complete an ECSI Instructor application here. If you have little or no teaching experience but would like to learn how to train others to perform life-saving skills, like First Aid and CPR, you can participate in an ECSI Instructor Development Course (IDC). This course covers topics such as teaching methodologies, complying with ECSI policies and procedures, following course objectives, and conducting skills practice sessions. The IDC is administered by authorized ECSI Instructor-Trainers. Complete the ECSI Instructor application now to get started. If you have any questions about the application or sign-up process, please contact the ECSI Membership Office at 1-800-716-7264. If you have any other questions, please contact Tom Florio at thomf007@aol.com.